Tiffany Cabán, the socialist running for Queens District Attorney, gained significant endorsements from the Working Families Party and state Sen. Julia Salazar this week. Other coveted as-yet undeclared backers include Cynthia Nixon, Public Advocate Jumaane Williams, Queens state Sen. Jessica Ramos and, of course, Alexandria Ocasio-Cortez — who recently told a Queens community board that she doesn’t plan to endorse, despite outlining criminal justice priorities most in-sync with Cabán. While nearly all of the leading law enforcement unions have lined up behind former Queens judge Greg Lasak, Borough President Melinda Katz recently picked the support from 32BJ, the large building service workers union. Both 32BJ and Katz were leading supporters of the Amazon deal. Katz, Lasak and Cabán thus appear to be the leading contenders in the race, which will see a shakeout in the next two weeks when the deadline for turning in ballot petition signatures arrives on Thursday, April 4. The number of petition signatures required to gain a ballot slot in the June 25 Democratic primary is 4,000. Rival campaigns may challenge the validity of those signatures, so the various contenders are aiming to exceed the minimum. The number of signatures candidates collect is one bellwether of their campaigns’ strength. Of the seven candidates currently gathering petitions, the two at the opposite ends of the spectrum, Cabán and Lasak, foresee turning in anywhere from 10,000 and 12,000 signatures. Cabán’s team provided the 10,000 number just before this week’s WFP endorsement. Former Nassau prosecutor Betty Lugo didn’t respond to an inquiry but last week she told the Queens Chronicle that she’d consider running on the Republican line (if it’s offered to her). Such an overture is unlikely to help Lugo if she indeed qualifies for the Democratic primary. With the Nieves and Lugo campaigns in jeopardy, it remains to be seen whether seven candidates will reach the June primary. 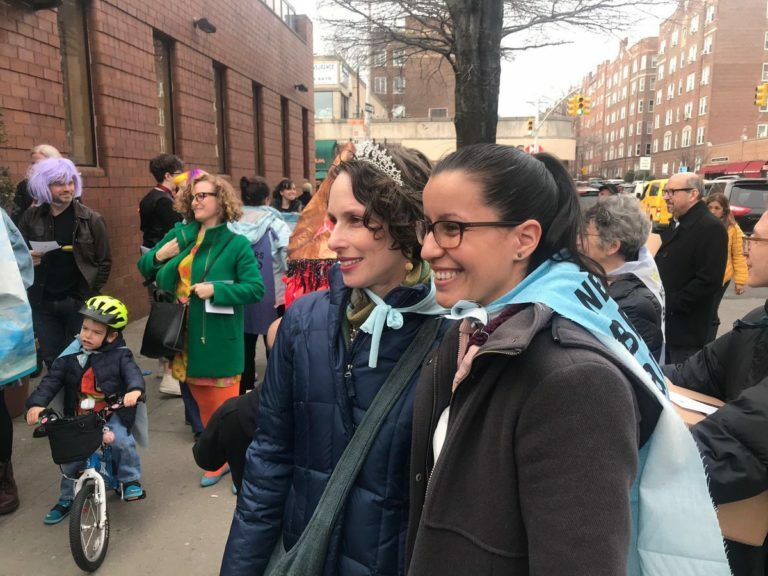 Photo: Tiffany Cabán attends a Queens Purim celebration. Credit: @CabanForQueens.